A friend shared this recipe with me recently. She says the secret is the merlot. Let me know what you think of it. Microwave the berries in a 9 inch deep dish pie plate 10-15 minutes. Stir half way through. Drain, discard all but ¼ cup juice. Toss berries, juice, merlot, ¼ cup sugar, and cornstarch in a large bowl with the wine. 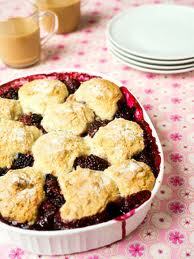 Spread berries in pie plate. Pinch off teaspoon size pieces of cookie dough and arrange evenly over berries. Sprinkle remaining sugar and cinnamon over dough. Bake at 375 degrees for 25 minutes. Cool 15 minutes before serving. These are directions for sugar cookies. Don’t bake them for the above recipe. 1. Preheat oven to 375 degrees F. In a small bowl, stir together flour, baking soda, and baking powder. Set aside. 2. In a large bowl, cream together the butter and sugar until smooth. Beat in egg and vanilla. Gradually blend in the dry ingredients. Roll rounded teaspoonfuls of dough into balls, and place onto ungreased cookie sheets. 3. Bake 8 to 10 minutes in the preheated oven, or until golden. Let stand on cookie sheet two minutes before removing to cool on wire racks. 4. Preheat oven to 375 degrees F (190 degrees C). In a small bowl, stir together flour, baking soda, and baking powder. Set aside. 5. In a large bowl, cream together the butter and sugar until smooth. Beat in egg and vanilla. Gradually blend in the dry ingredients. Roll rounded teaspoonfuls of dough into balls, and place onto ungreased cookie sheets. 6. Bake 8 to 10 minutes in the preheated oven, or until golden. Let stand on cookie sheet two minutes before removing to cool on wire racks.